The UK will leave the European External Action Service with full diplomatic policy and representation returning to the Foreign and Commonwealth Office (FCO). The UK will regain an independent trade and commercial policy, including the right to sign trade deals and bilateral investment treaties. The UK will also regain full control over development expenditure, currently part of UK’s contribution to the European Commission, and by leaving the common agricultural policy, will regain another area of policy with significant impact for developing countries. Such mass return of responsibility and policy autonomy will have large implications for our relations with the rest of the world. Amongst the many implications are an exciting opportunity to develop a tailored approach to trade and development policy. ​Such changes are helped by the genuine international credibility the Department for International Development (DfID) has acquired over the past 20 years, which has seen it become a UK success story. DfID’s international credibility and reach into emerging markets makes it a major UK asset post-Brexit, rather than the burden it is sometimes depicted. This is ironic given the regular overlap with ‘Brexiteers’ and UK aid critics. 1. Challenging the isolationist narrative surrounding Brexit, and demonstrating a UK positively engaging with the world with a development budget far more generous than comparable countries, and more effective than most comparable agencies. 2. Formulating a progressive trade policy with regards to developing countries, a trade policy which can support developing countries in growing their export base as well as UK consumers in terms of access to cheaper products. The UK’s strong development record and openness to developing country exports makes the UK well-placed to develop creative synergies between development and trade policy. This includes developing bespoke and advanced economic partnership agreements with developing countries, magnifying mutual benefits to both parties. The UK can go far beyond the EU’s attempted economic partnership agreements, with looser rules of origin and greater access to agricultural imports and processed products. The integration of trade and development policy will change the relationship between the UK and developing countries from ‘donor-recipient’ to that of ‘partner’. Such a change should be formalised by DfID being re-launched post-Brexit as the Department for International Partnerships (DfIP). The approach from the new DfIP should be one of partnership with developing countries, with a strong focus on the commonwealth. In addition to expanding trade opportunities between the UK and developing countries, such partnerships would include UK technical assistance to support the conditions for growth in developing countries. Provision of technical assistance has been a vital part of DfID’s success, and a major comparative advantage for the UK in the development sector. The need for developing countries to develop finance and insurance markets and conduct economic and government reform dovetails with the UK’s first-class services and consultancy sector. The new Department for International Partnerships should significantly expand its use of such services in partner countries, reducing less effective forms of support such as budget support and funding through multilateral institutions. Such UK-funded technical assistance will support developing countries to overcome obstacles to development whilst providing a subtle and strategic approach to supporting UK service exports. The ‘raison d’etre’ of DFIP should be to facilitate connections between the needs of developing countries for access to finance, insurance and technical assistance and the needs for UK service industries for overseas markets to expand. This can be done directly via DfIP funded technical assistance, directly contracting UK expertise to support overseas development, as well as indirectly from tailored trade deals covering service access, in return for goods and agricultural products. The concept of partnerships can be extended to partnerships between DfIP and the private sector. Their interest in investing in, exporting to and importing from emerging markets dovetails with development objectives, as well as UK economic interests. The new DfIP should be the epicentre of such public-private partnerships for development, initiating a new and exciting epoch in the UK’s trade and development agenda. ​London possesses a greater nexus of international consultancy firms and international investors than any other city. This is a nexus which DfIP should capitalise upon to maximise the effectiveness of UK development support. Large scale poverty reduction will occur through transformational economic growth, which partly depends on barriers to investment being removed. There are many profitably investment opportunities in developing countries, but investment is held back due to a combination of political instability, and regulatory and other risks, obstacles which UK technical assistance can help overcome. The new DfIP should actively work with UK private companies with interests in developing countries, including City investors, food and clothes importers and others to remove barriers to mutually beneficial trade and investment. Given the need to reinvigorate the commonwealth, the new DfIP should form a much closer working relationship with the Commonwealth Secretariat. This could include utilising the Commonwealth as an institution to coordinate, finance and manage trade and development partnerships between commonwealth members. 20 years after the creation of DfID, this is an exciting time for UK development policy as it has the opportunities afforded to it by leaving the customs union, the common agricultural policy and EU development programmes. 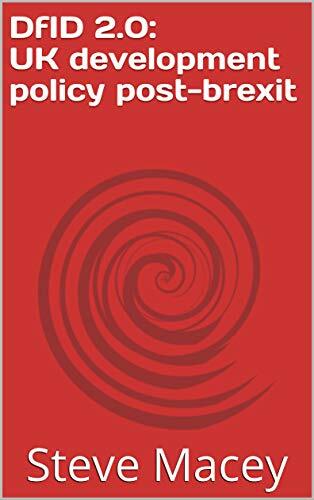 A short book at just over 14,000 words, DfID 2.0: UK development policy post-Brexit sets out a creative agenda for the UK to integrate trade and development policy after Brexit. Readers of this blog will be familiar with this line of thinking which is actually better defined by Macey, in that I have looked mainly at trade facilitation and technical assistance on trade in goods. He is absolutely right to say that trade and development need reintegrating and in this field the UK is far from a laggard. It is absolutely vital that we keep up our existing level of participation in these such affairs. How much of this can be realised will to very large extent depend on what kind of future relationship we have with the EU. Obviously a programme of this nature will have to be financed which will be far more difficult in the event of no deal and a lot more difficult in the face of a populist revolt against foreign aid of any kind. Relaxation of origin rules may also have implications for our trade and may prove impossible should we end up aligning with the customs union. We may also find ourselves to a very large extent tied to the Common Commercial Policy. It should also be noted that the EU will keep a very close watch over what the UK does and will seek to frustrate the UK if anything we do interferes with their own regional agenda. What is refreshing here is seeing the debate advanced beyond the usual chatter about FTAs. Even without full control over our trade policy in the sense that most people understand it, there is little stopping us pursuing an active development partnership programme that could very well yield results worth as much or more than the average FTA - which are overstated in their importance anyway. I have long taken the view that DfID is a much underrated department and in terms of what I do read, their research tends to be the best. It's the one arm of the UK government which has not suffered from atrophy of expertise while in the EU. It will prove an essential tool in any post Brexit foreign and trade policy even if Macey's merger proposal is not heeded. Macey is also right to envisage a role for the Commonwealth. Whenever the C-word is mentioned it tends to provoke a snort of derision, and is often written off as an obsolete relic. Though it is no longer capable of becoming a formal trade entity as they are now commonly understood, it is still a forum through which we can advance our interests to our mutual advantage. The Commonwealth is often criticised as lacking any real purpose. A reinvigorated development policy could very well be the kickstart it has needed for some years. There is a perception afoot that the big three trade superpowers have it all sewn up and through their network of FTAs, the EU especially, that there is no much scope for the UK as a mid ranking power to act independently. I absolutely refute this in that there is no end of work to be done in the field of international development which presents any number of opportunities for a newly agile country. the UK has inherent expertise in banking and telecoms and the rush to expand internet connectivity creates more opportunities still. 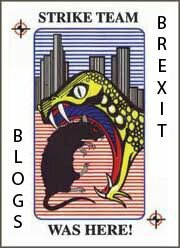 Presently there is a great deal of churlish negativity about the UK's trading potential. Our success is generally measured by notches on the bedpost for number of FTAs, which is a shallow and inaccurate way of looking at it. 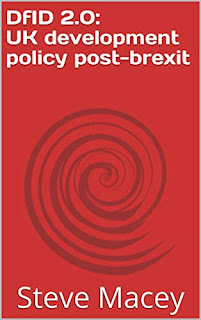 Should we avoid crashing out of the EU without a deal then we have sufficient time to rollover the more important FTAs but our future success will depend heavily on having a full and active development policy working in the direct national interest.In respect of that, Macey is right to say it presents a "new and exciting epoch in the UK’s trade and development agenda". In this domain, the UK has no shortage of expertise and it should be remembered that when we leave the EU we repatriate much of the brainpower we normally deploy to Brussels. The new intellectual centre of our efforts should pivot to Geneva, working through the ITU and UNECE as indeed we already do quite successfully. Sooner or later the Brexit histrionics will wear off and the negativity will subside. By then, there will be space and demand for fresh thinking, and Macey is certainly in the right ballpark. It's taken four years but I've finally found someone I essentially agree with. Stranger things have happened - but not in recent memory.